If you like colorful dinnerware, you will love Fiesta dinnerware. 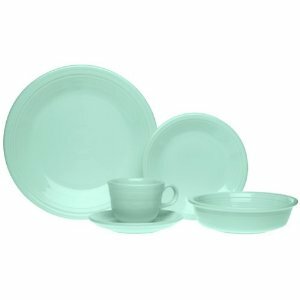 It is ceramic dinnerware that has been produced in several solid colors since 1936. 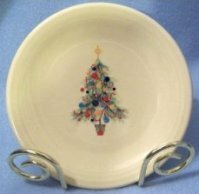 Over the years the colors have changed and this type of dinnerware has caught the attention of collectors. Click here for a list of distributors of Fiesta. Photo compliments of Zesty Dishes - published with permission. This dinnerware was designed by Frederick Hurten Rhead and it is produced and marketed by The Homer Laughlin China Company who owns the trademark. 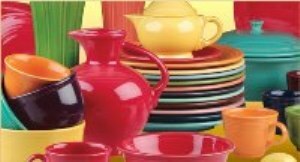 Its popularity prompted competitors to produce solid-colored dinnerware which led to the term "Fiestaware" which is used to describe colorful dinnerware; however, the original name of this dinnerware is simply "Fiesta". Are You a Collector of Fiesta Dinnerware? We would love to see your collection of Fiesta, hear your story and tips of how you use it to make your table setting spectacular! This colorful dinnerware has been produced in several colors. They are available for a few years and then the colors change. Some dinnerware has been produced for limited runs (2 years or less). These include Sapphire, Lilac and Chartreuse. 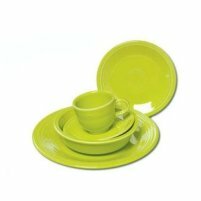 What is really cool is that you can find Fiesta Dinnerware Sets in an individual color, or you can buy the dishes in open stock and mix and match the colors. I really like that idea. I wonder what 2014 has in store for us! While Fiesta is known as solid-colored dinnerware, Homer Laughlin China has introduced a few seasonal patterns. These include Fiesta Christmas Tree, Fiesta Candy Corn, Fiesta Fall Fantasy, Fiesta Happy Pumpkin, and Fiesta Scarecrow. Long ago Fiesta Casuals, featuring floral patterns, hit the market. These dinnerware patterns are ideal for coordinating with solid-colored Fiesta dinnerware. 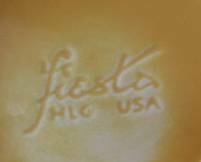 To identify genuine Fiesta pieces, it pays to get familiar with the backstamps; however, unstamped Fiesta dishes are not uncommon. If you intend to collect vintage Fiesta dishes, I suggest that you get a collector's guide to ensure that the pieces that you accumulate are actually authentic Fiesta. 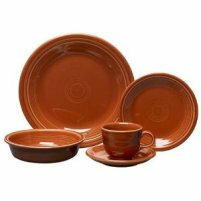 When shopping in a Fiesta Dinnerware Outlet, you will realize that the dinnerware is not usually sold in sets. It is most frequently sold as open-stock which enables you to buy different colors of various pieces to design your own table with a touch of class.